After every snowfall this winter, friends and co-workers have asked me, "Did you use your new snow thrower? My answer was always the same, "No, not yet because...". Sometimes it was dark when I got home, and I really wanted to use it for the first time when it was light out. Other times, I didn't think there was quite enough snow to justify using such a large snow thrower, so I used my smaller snow blower instead. But truth be told, I was just a little bit afraid of such a large gas-powered machine. Finally, it snowed enough sometime in January that I decided I would use the Troy-Bilt Storm 3090 XP Deluxe Two-Stage Snow Thrower they sent me in November to review. Short version of the review - It sure can throw snow. 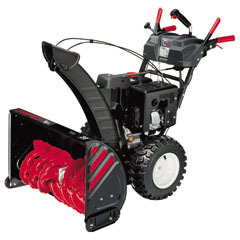 If you get a lot of snow, this is the snow thrower for you. Long version of the review -- Finally, we had enough snow that I decided to try out the snow thrower. I left my car on the street, because my driveway is steep enough that I knew I wouldn't get it up the driveway with the six inches of fresh snow on it. This also ensured I had enough room to get the snow thrower, which is 30 inches wide, out of the garage. I reviewed the directions one last time, filled the tank with gas, plugged in the electric starter, did all the other pre-start things required and fired it up. It started easily, and was quieter than I though it would be. Slowly I pushed down on the handle-thingie to make it "go" and wheeled it to the edge of the driveway, sure that its bright headlight was probably now serving as a beacon to make everyone in the neighborhood out shoveling their driveways turn and look in my direction. Then I pushed down on the other handle-thingie to engage the snow throwing parts and took off in the slowest of the six speeds. Down the driveway I went, throwing snow high up into the air and off the driveway. At the foot of the driveway, I pulled up on the lever to make it turn right and headed back up the driveway, still throwing snow in a high arc as I went. After a few more passes, I was beginning to feel more confident in my ability to steer the snow thrower and more or less keep it going in a straight line. I moved on to the sidewalk, which is not much wider than the 30 inch wide snow thrower. I managed it okay as well and in no time at all I had my driveway cleared, along with my sidewalks, and put the big machine away. A few days later, I noticed some scratches in my driveway, almost exactly the width of the snow thrower. Hmmm... something must not have been adjusted quite right. After a few emails back and forth, Troy-Bilt suggested I lower the skid shoes just a little bit so that the "scoop part" of the snow thrower doesn't rest on the ground, but clears it just barely. I can do that by loosening four bolts. My overall assessment is that this is an awesome, powerful snow thrower, but it is bigger than I care to use or probably should use, and so soon I'll be looking for a local charity who has the need of such a machine, and will donate it to them. I figure if we get so much snow that using this big snow thrower is the only way out, I probably have no business going out anyway. I'll continue to make do with my single stage snow blower, also a Troy-Bilt, that I purchased three or four years ago. It also has an electric start (which I highly recommend for any gas-powered anything, including lawn mowers) and does a good job of handling the snows we are likely to get.